Caught up with Amsterdam, Berlin, Prague, Vienna, Budapest, Zagreb, Ljubljana, Zurich & Luxembourg? Woah! Paris? That wasn’t on your route we hear you say! (Probably not actually)But we’ve come for two days in between Zurich and Paris and we are pleased to announce that we are going to Disneyland tomorrow!! The excitement is unreal but it does mean that we have only one evening to explore Paris itself!We have been to Paris once before for my, James’ birthday last year. 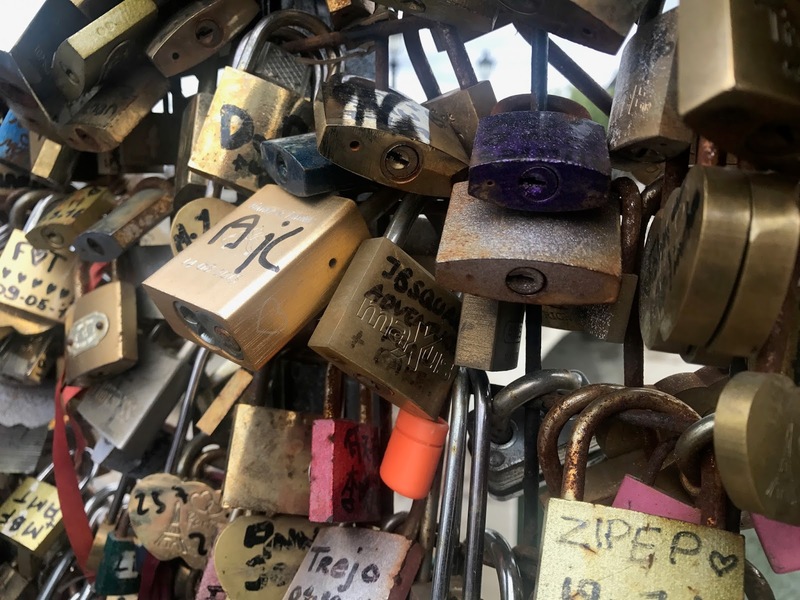 We locked a love lock on the Pont des Arts, the bridge most famous for this kind of thing – there must be thousands of locks on this one bridge! 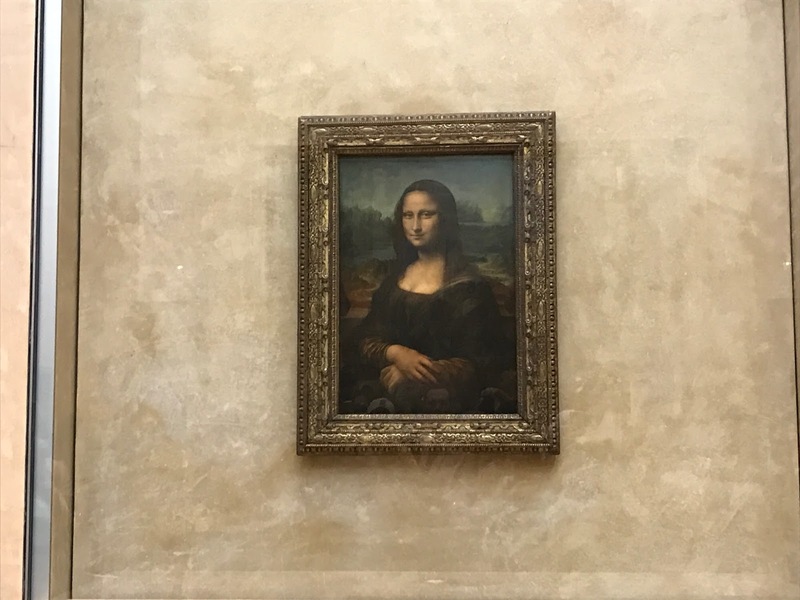 We made our first mission to go back and find it and miraculously we did!Look right in the middle of the photo – JBSqaredAdventures / Food & Baker From there we took the short walk over to Musee de Louvre – the largest museum in the world and home to many great art pieces including the one and only Mona Lisa. We were very happy to find out that here along with many other national monuments are free for 18-25 year olds, so we took the opportunity to go in! We’re not going to lie, we came for one thing and one thing only, and especially with time being of the essence, we didn’t stop to look at much else other than the one painting. Crowds were swarming to get a glimpse around the Mona Lisa, some even trying to get selfies with it for some reason, but after doing exactly the same ourselves, we moved on. Our final stop of the day was the Arc de Triomphe, and as it was getting past sunset by this time, we would be up there to see the glistening Eiffel Tower on the hour of 10pm. The tower glistens for 5 minutes on the hour, every hour past dark. After making our way up many flights of stairs, we finally made it to the top which gave breathtaking views of the entire city. But of course, 90% of people were shrouded in one corner, to see the tower. It was pretty spectacular but hard to capture the lights on camera. Hopefully the vlog will do it better justice! From here we made our way back to our AirBnb as we needed some very good sleep. We have an incredibly exciting but long day ahead tomorrow as we’re off to Disneyland! You don’t need me to tell you to come back tomorrow for that blog post! The Arc de Triomphe is amazing, I loved visiting there! I remember the crush around the Mona Lisa too. I really want to go to Paris again. I don't like thinking too much about the last time I went to Paris (I went with an ex and it was pouring with heavy rain the entire time. The Eiffel Tower was even closed!) so I'd love to go and see the sights again properly!